What’s the best material for a deck in the Pacific Northwest? Homeowners have a wider range of options for decking material than they did a few years ago. Wood is the traditional choice for decks. It’s natural and looks good, but it requires upkeep. Manmade materials are growing in popularity. These synthetic materials continue to improve, and some are nearly maintenance free. Each type of decking has pros and cons. Choose the right decking material for your home based on budget, sense of style and tolerance for maintenance. A lot of homes in Washington and Oregon boast decks made from cedar or redwood. These western natives naturally resist rot and insects. The wood is easy to work and looks great. Wood can be a budget-friendly material, though it depends on the grade of board. Higher grades are more durable, but they cost more. For those who prefer natural, sustainable materials, either type of wood is a good choice. Wood boards need a sealer. Even though cedar and redwood stand up to the wet weather in Washington and Oregon, a waterproof sealer will give them many more years of life. If you plan to build from cedar or redwood, invest in a higher grade of board. Plan to refinish or at least touch-up a natural wood deck once a year. When properly cared for, cedar and redwood should last from 15 to 20 years. Pressure-treated boards are enhanced with insecticides and chemicals to prevent rot. This type of wood is affordable, durable and the most popular decking material. Treated wood can last for decades, much longer than natural wood. Many people choose to build a deck with pressure-treated wood because they want a deck that lasts for a long time. Pressure-treated wood requires less care than cedar and redwood. If you build a deck with treated lumber, you’ll need to apply a sealer every couple of years. In 2004 manufacturers of pressure-treated wood changed the way they produce and label their products. 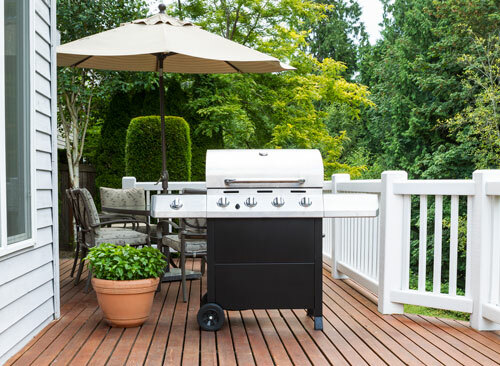 Boards rated for residential decks contain fewer harmful chemicals. They are considered safer than wood manufactured with chromated copper arsenate, CCA. CCA-treated lumber has not been banned, but it’s no longer sold as decking material. Composite boards are made from wood fiber and recycled polyethylene. This decking material often mimics the textures of natural wood. You’ll have a choice of different colors and designs when you choose composite decking materials. Versatility and low maintenance are the hallmarks of composites. Unlike wood, you won’t need to stain or seal a composite deck. Clean your deck with a pressure washer as needed. This man-made material won’t rot, but it could host mold. Polyvinyl chloride boards are quickly catching on with homeowners. These synthetic boards are manufactured to look like wood. They contain no organic fillers. The boards won’t warp, rot or fall prey to insects. Some boards come with a 25-year warranty. If you’re looking for a deck that’s immune to rotting and requires no maintenance, PVC might be for you. PVC decks are more expensive to install, but you won’t spend money on yearly sealing and staining. Simpson Plumbing does more than care for your plumbing. We also remodel homes and build decks. Contact us for more information about our home remodeling services.